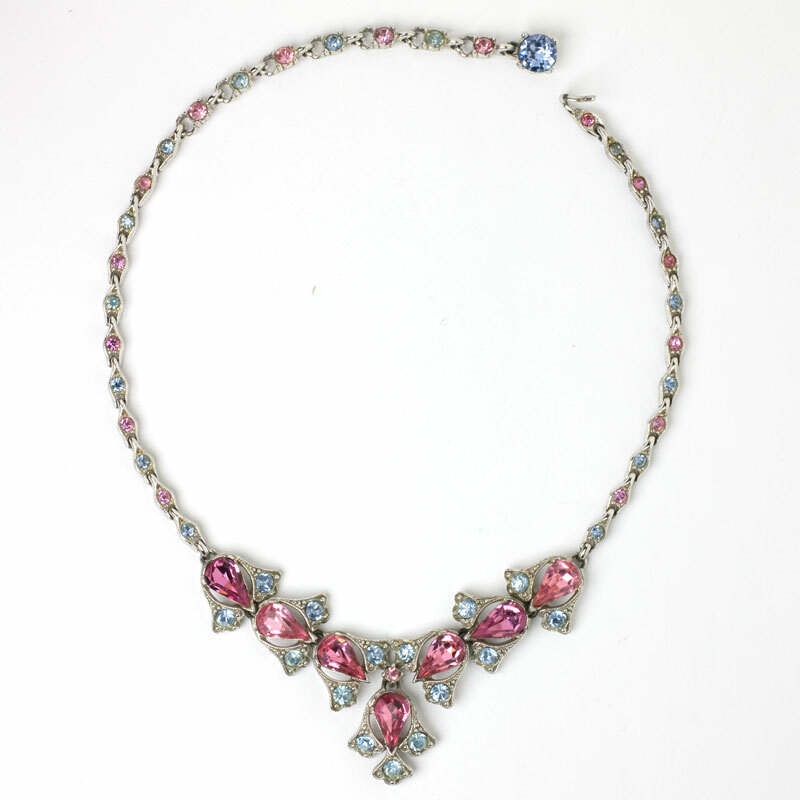 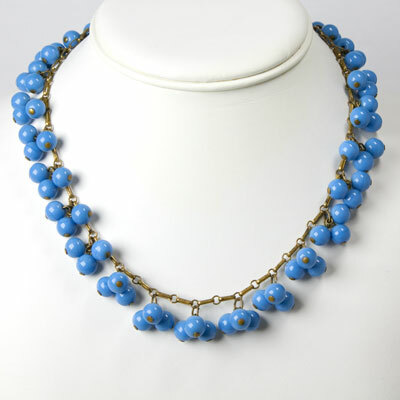 This late-1950s pineapple bead necklace illustrates a typical Carnegie theme – flora – with a clever combination of materials. 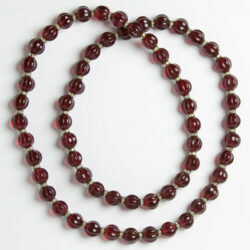 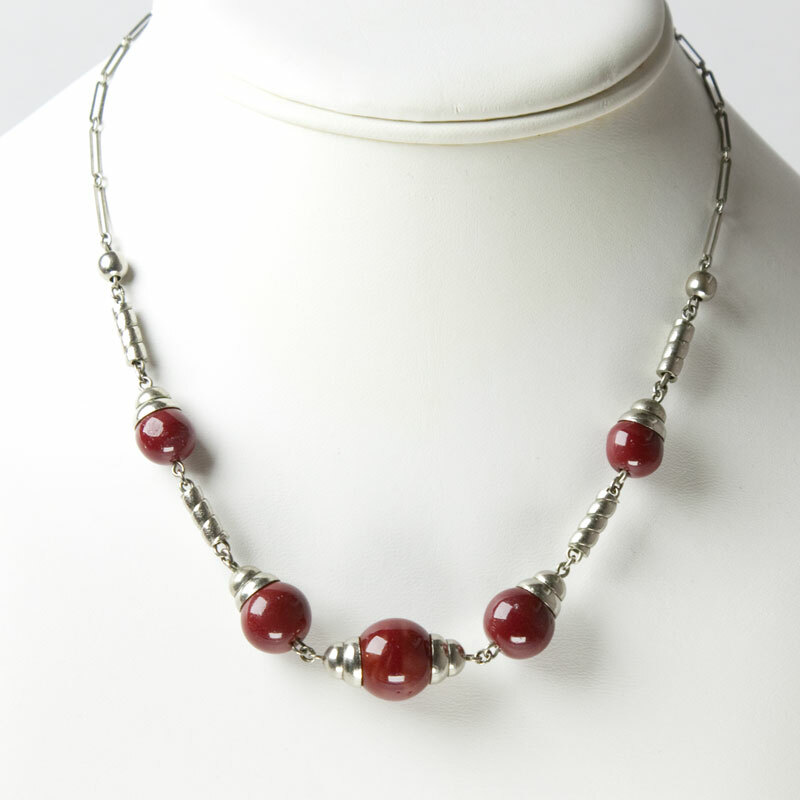 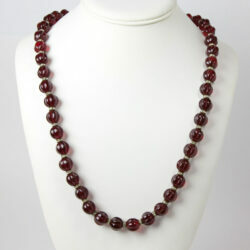 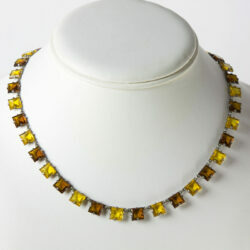 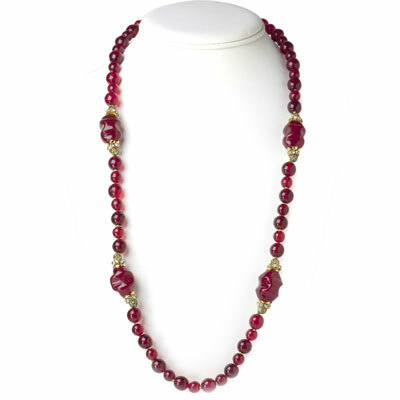 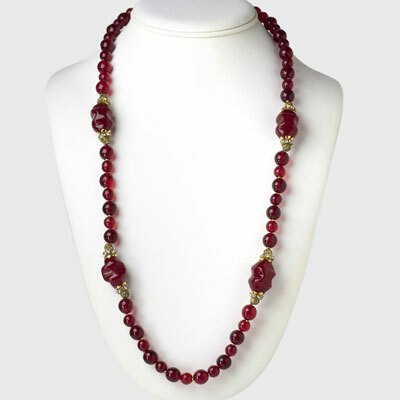 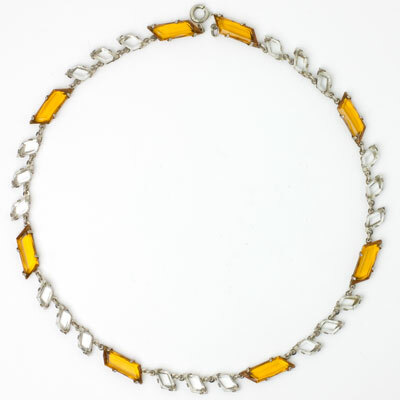 Textured, gold-tone pineapple-shaped beads alternating with small carnelian-glass beads form the main necklace. 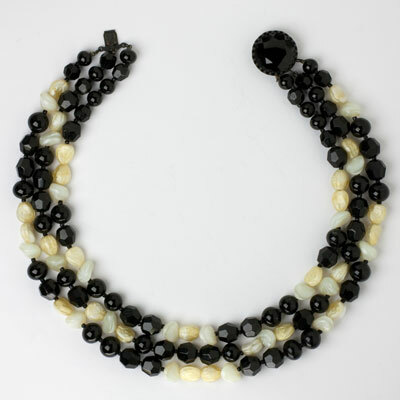 Gold-tone beads in various shapes combined with onyx- and carnelian-glass beads dangle from the entire length of the piece. 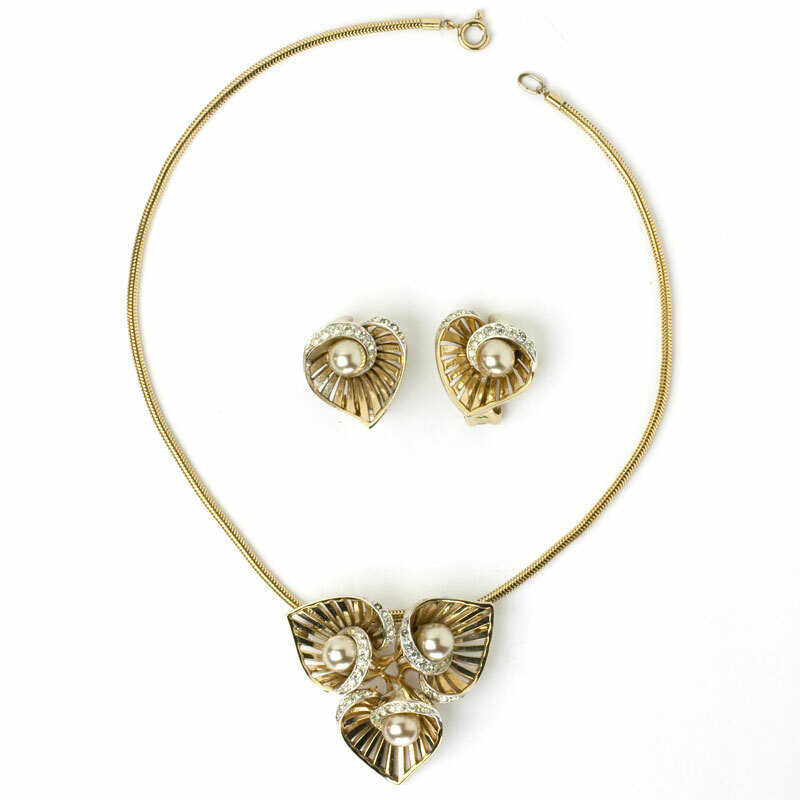 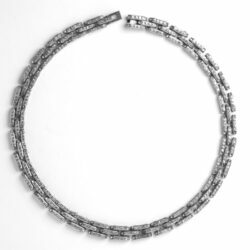 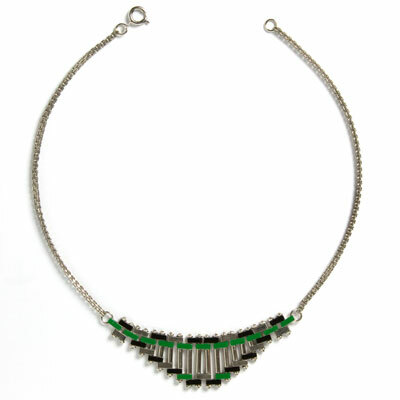 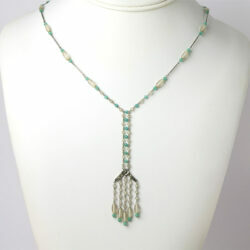 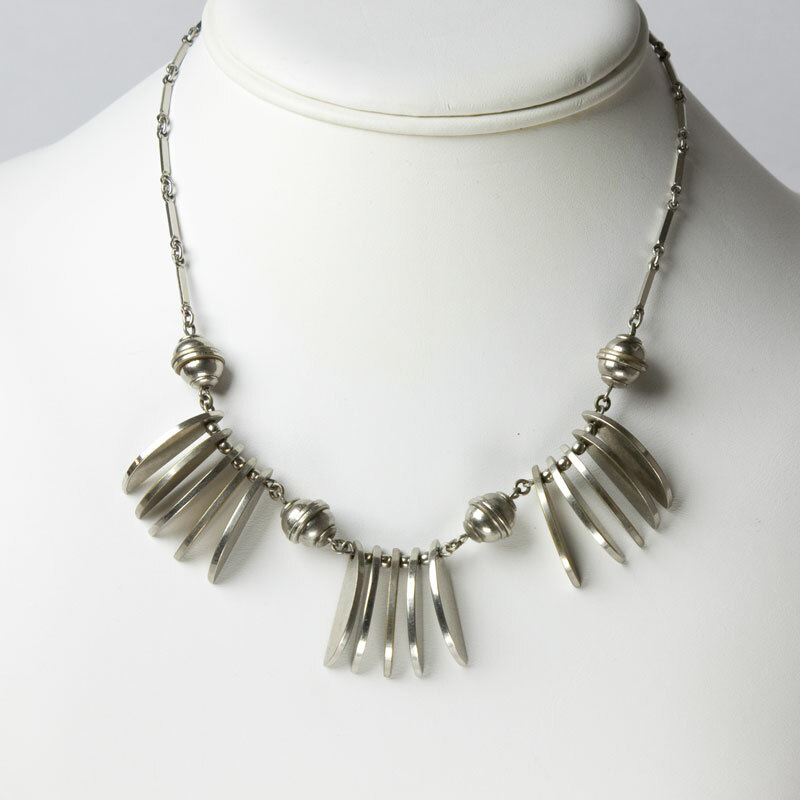 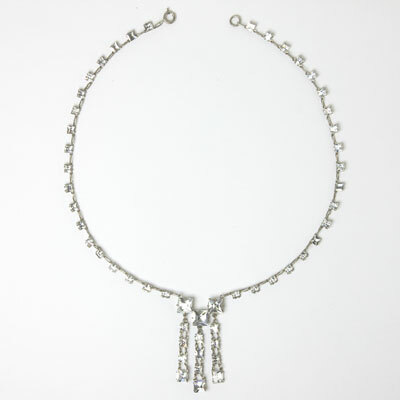 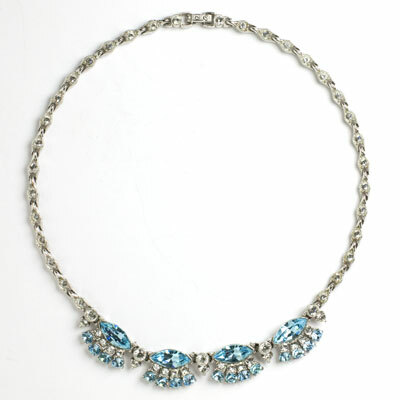 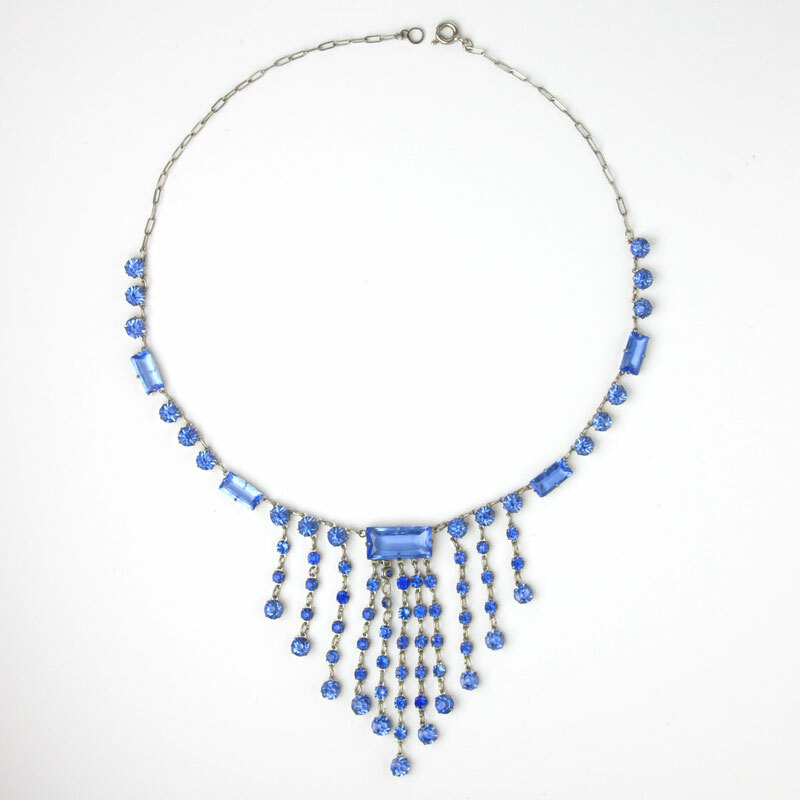 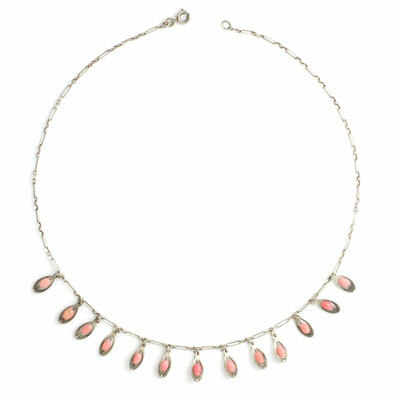 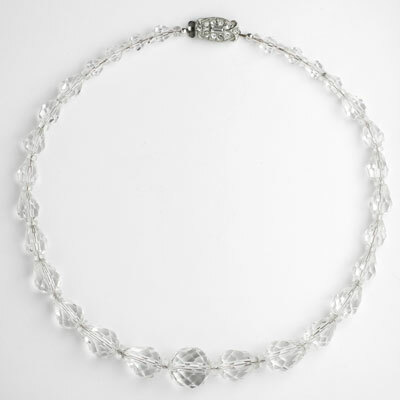 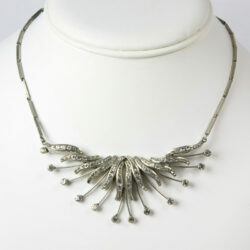 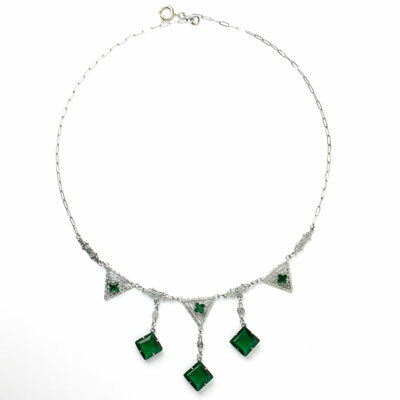 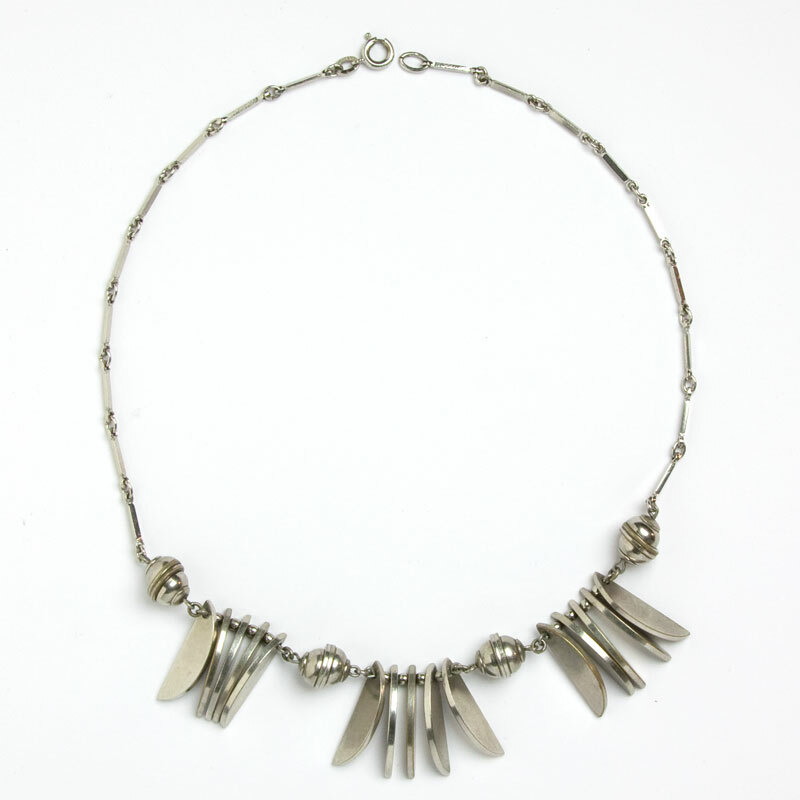 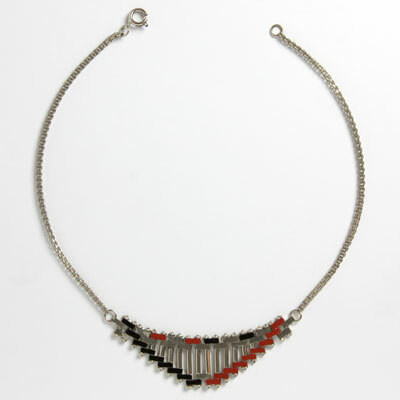 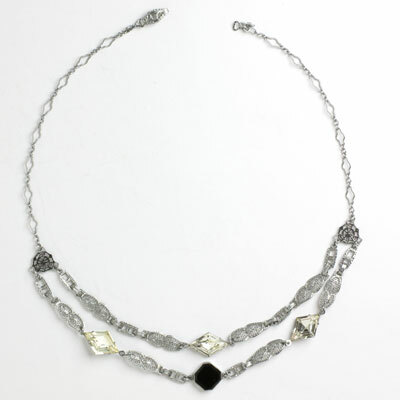 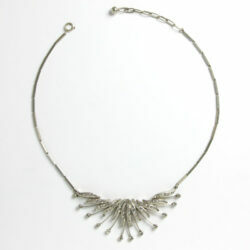 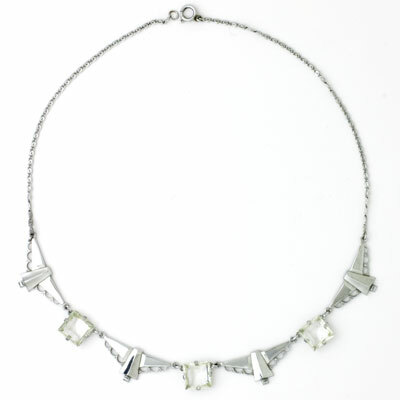 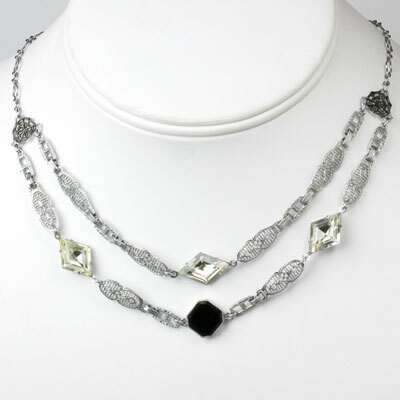 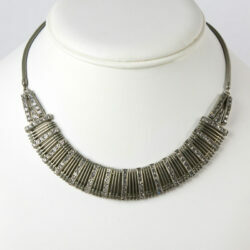 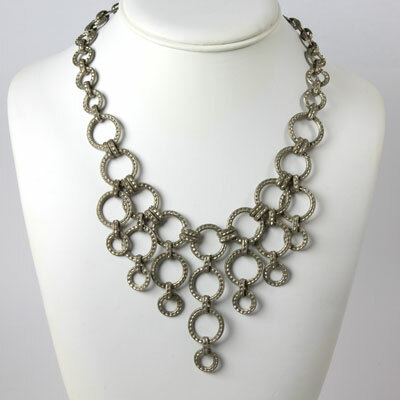 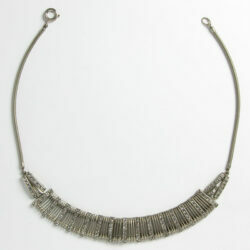 This elaborate fringe necklace closes with a pineapple-shaped concealed clasp. 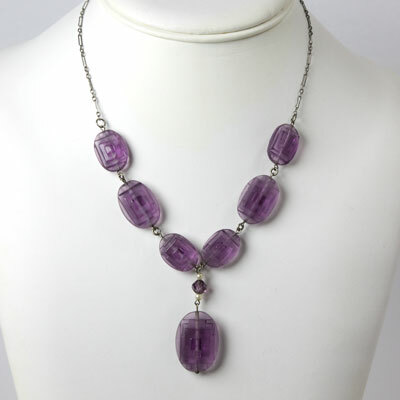 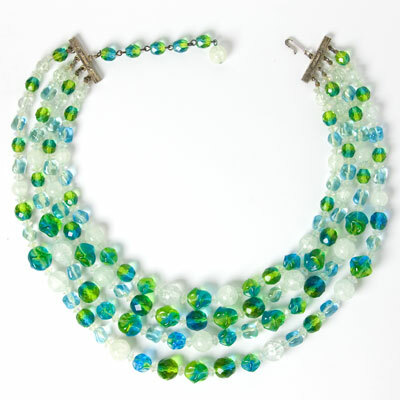 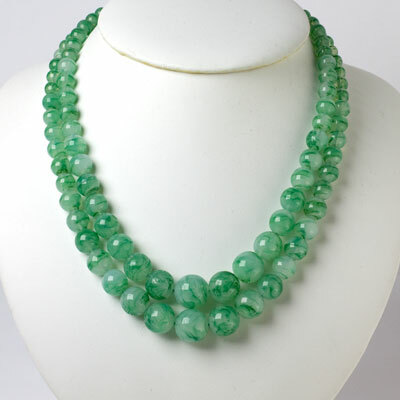 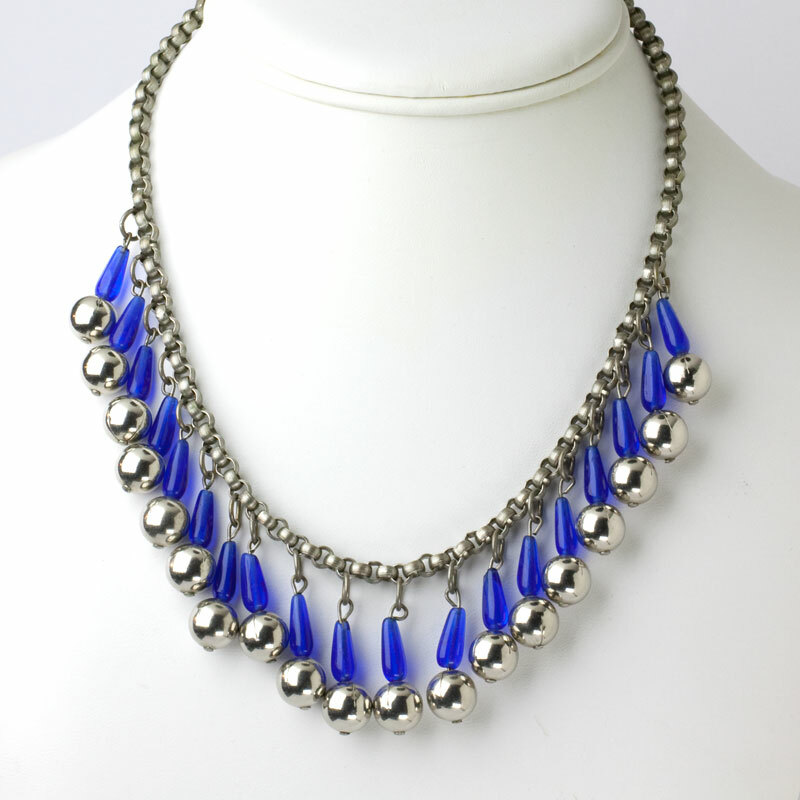 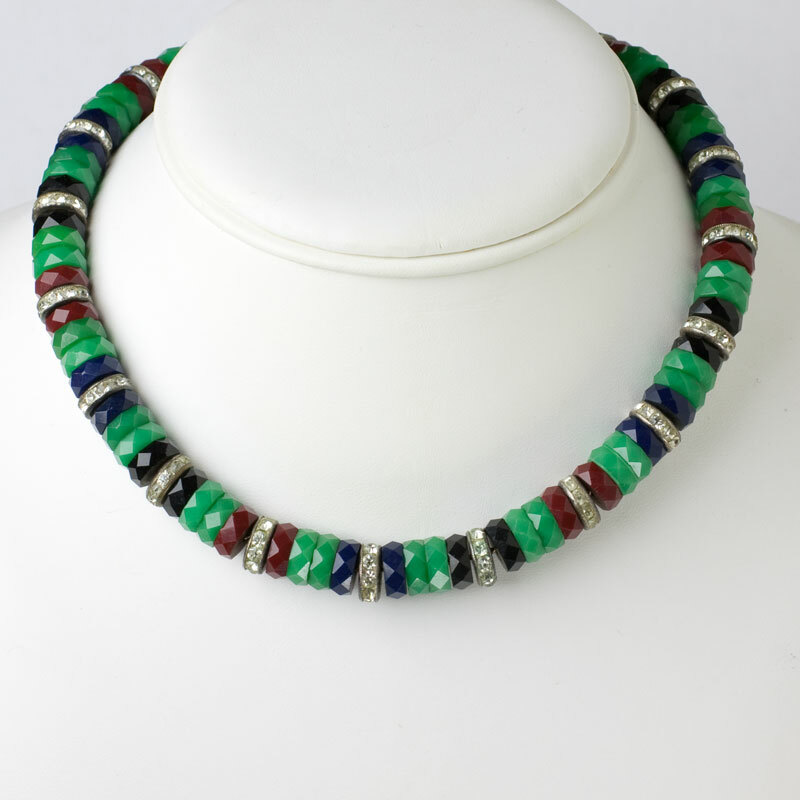 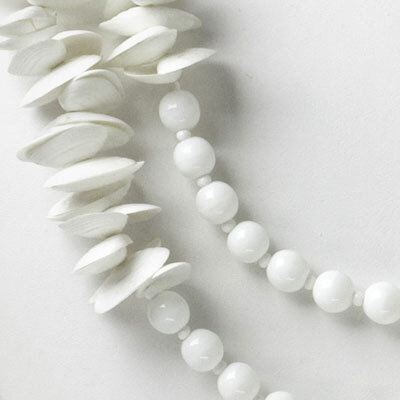 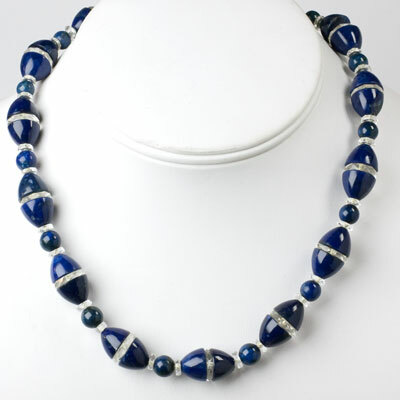 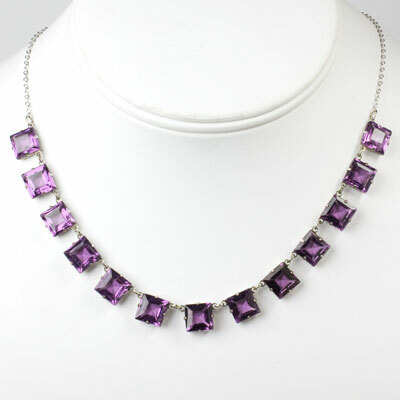 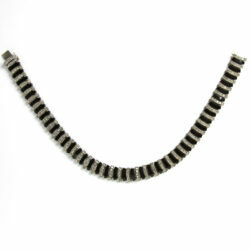 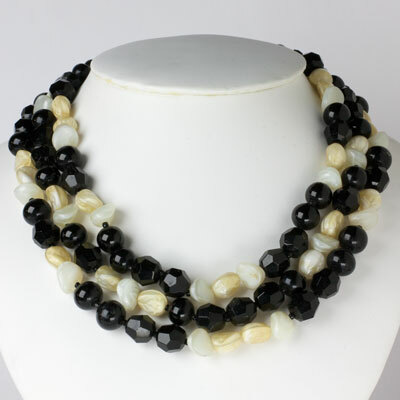 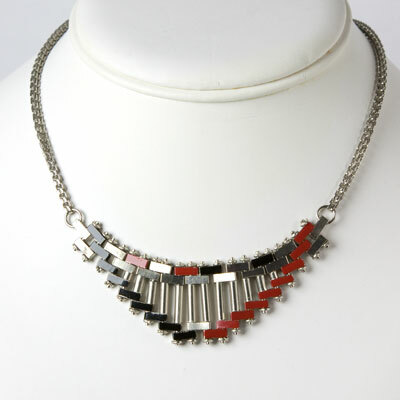 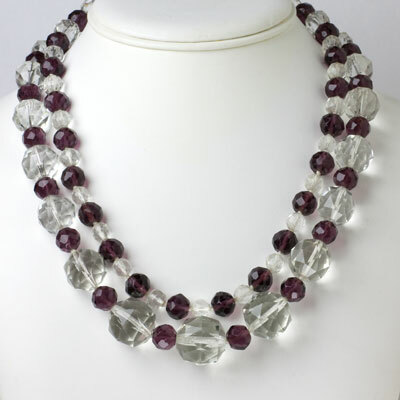 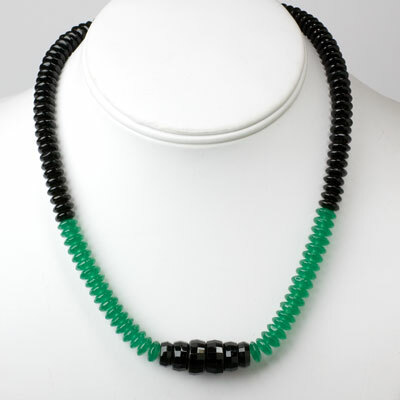 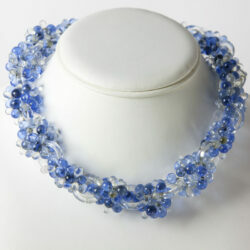 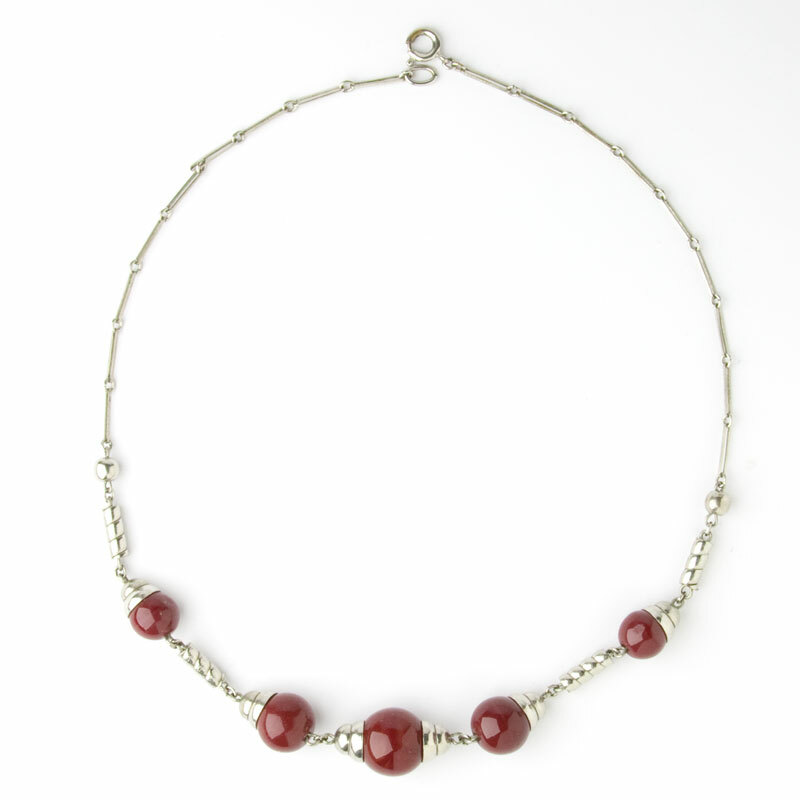 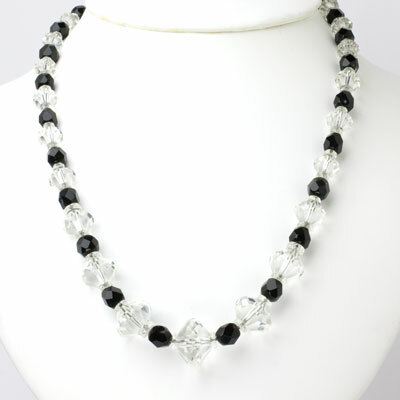 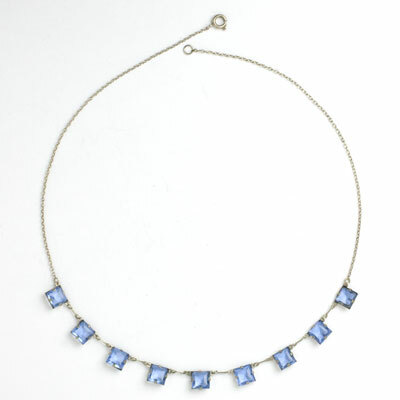 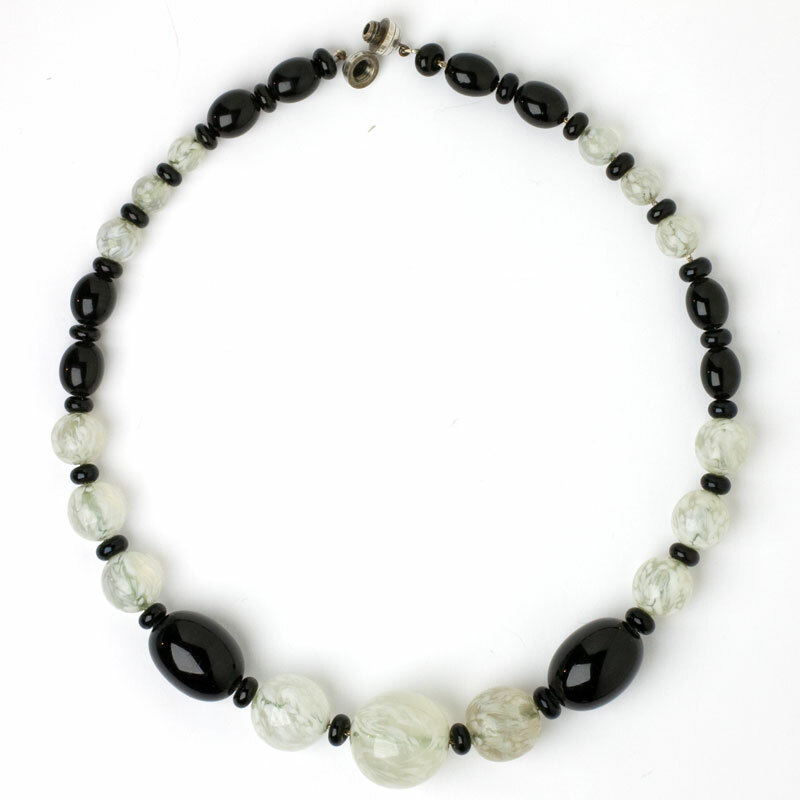 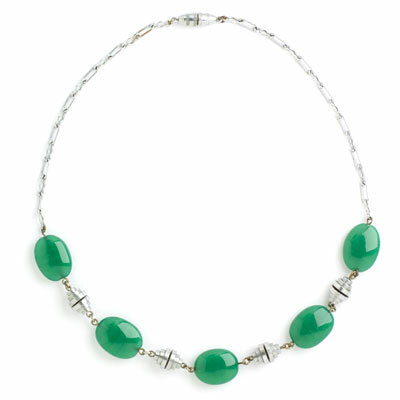 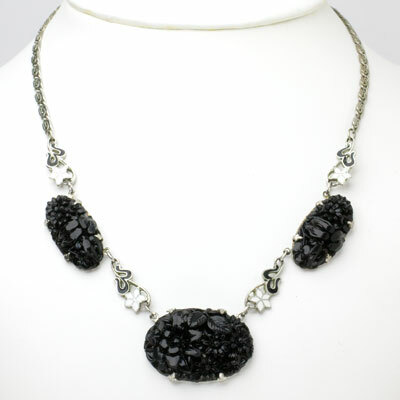 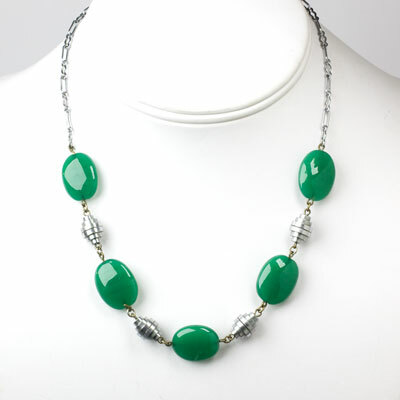 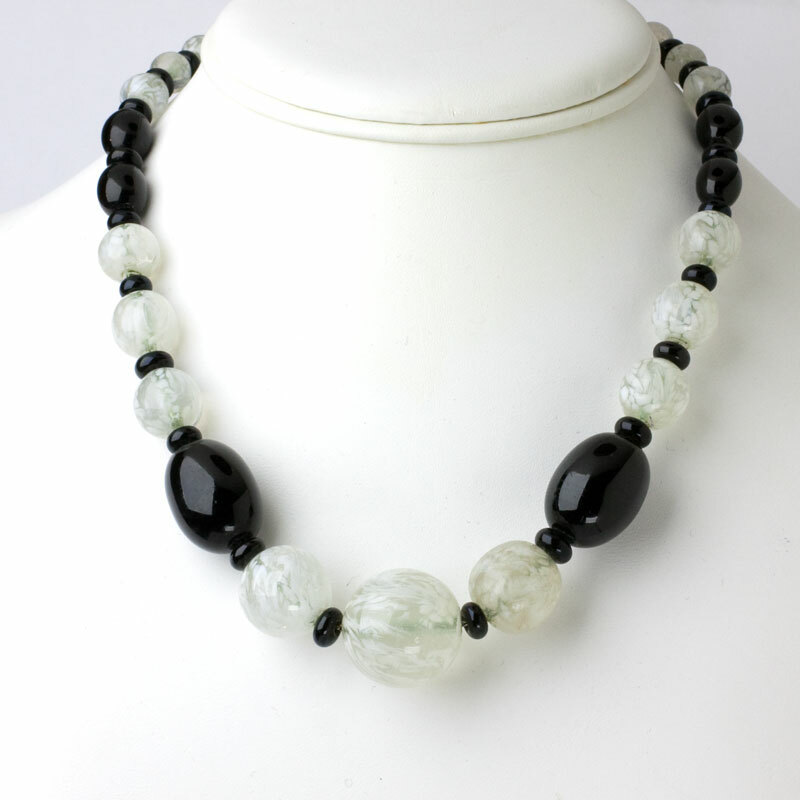 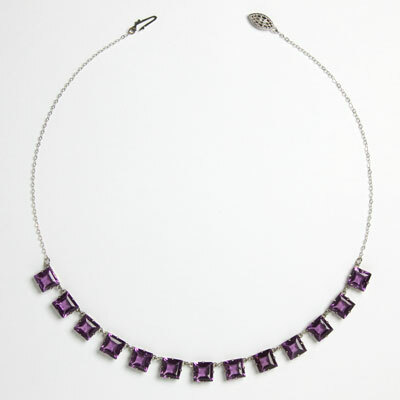 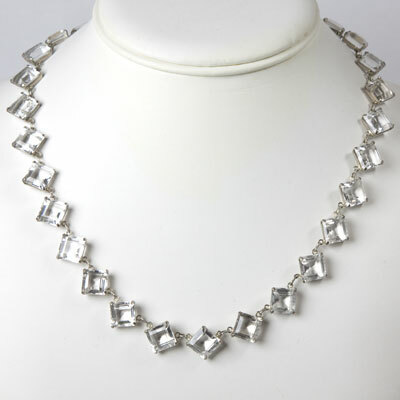 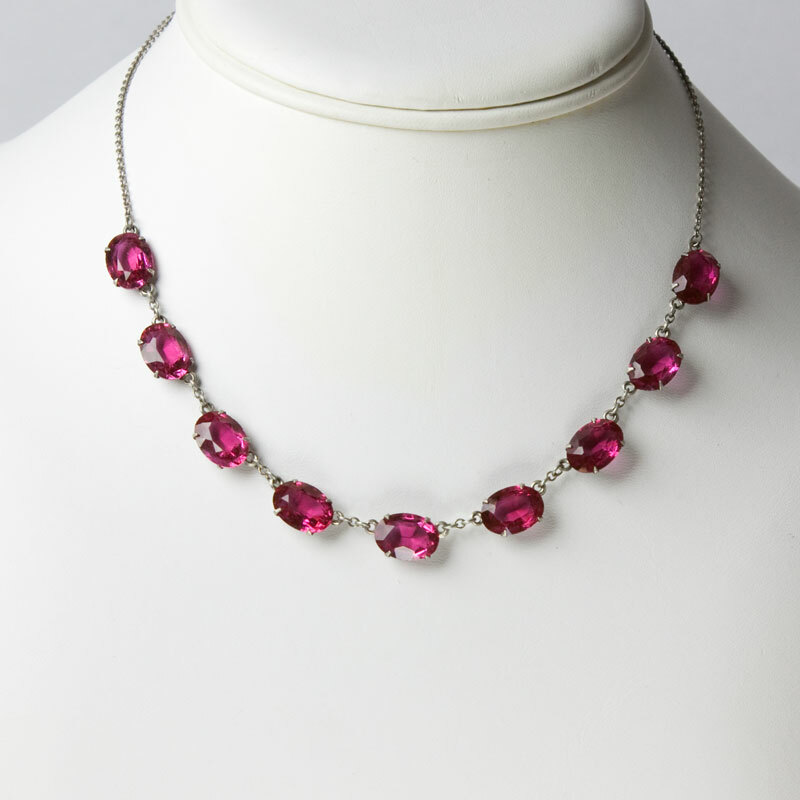 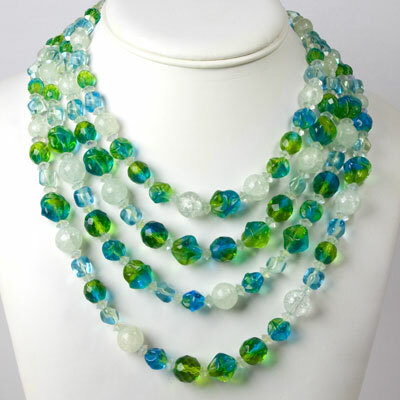 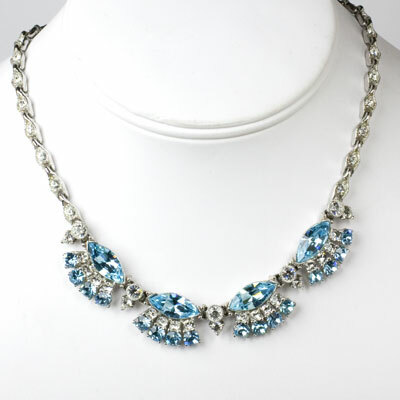 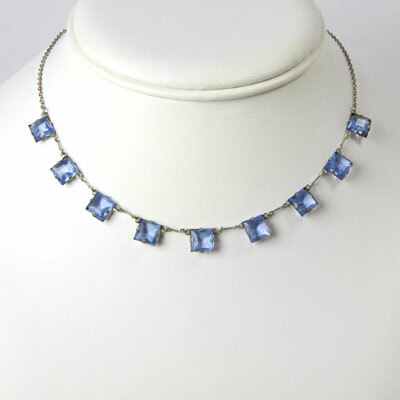 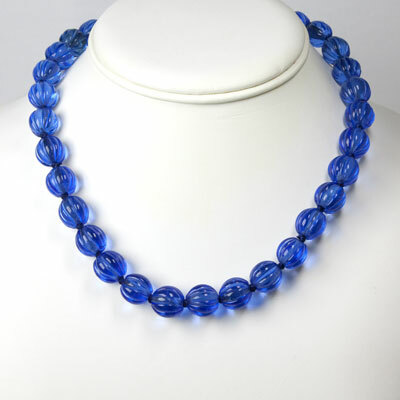 This jewel is the perfect adornment for a scoop-neck or strapless garment. 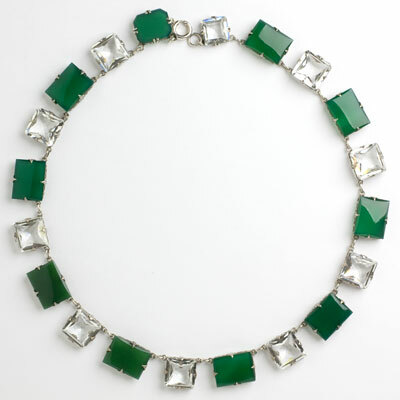 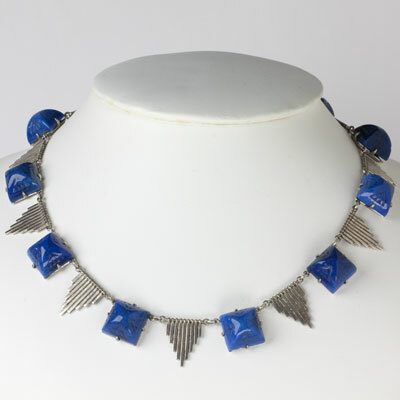 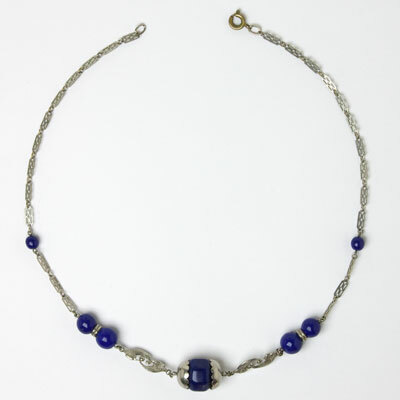 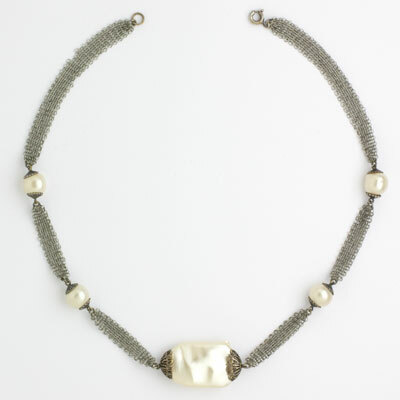 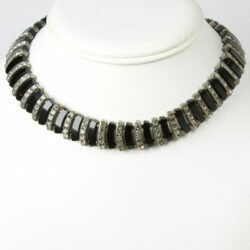 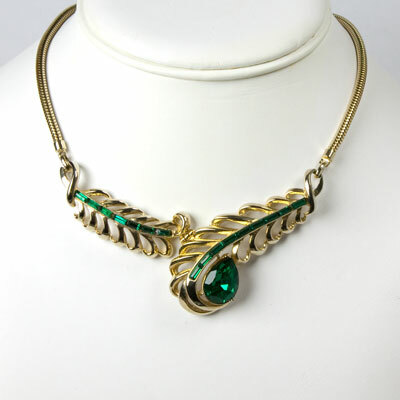 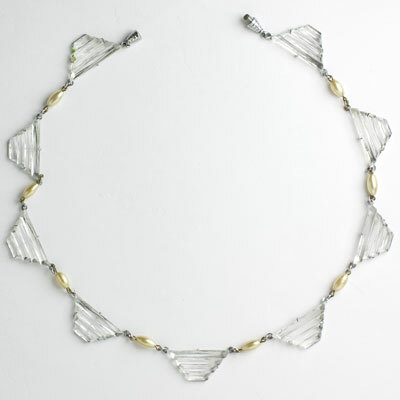 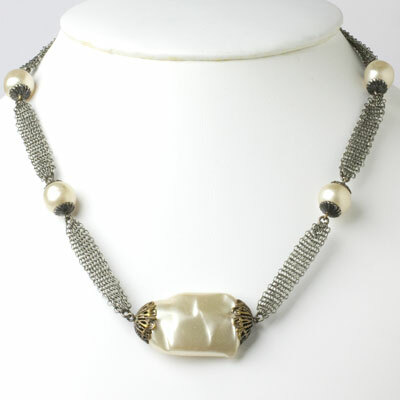 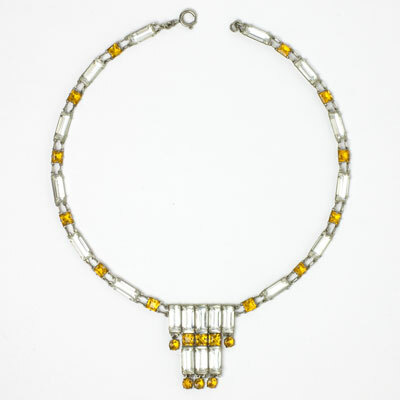 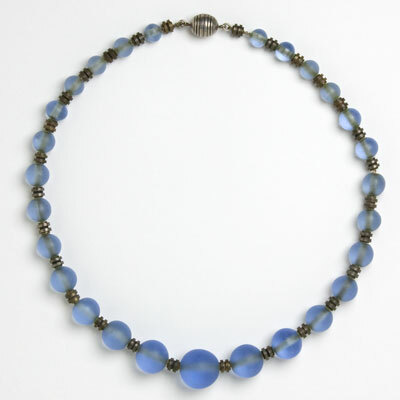 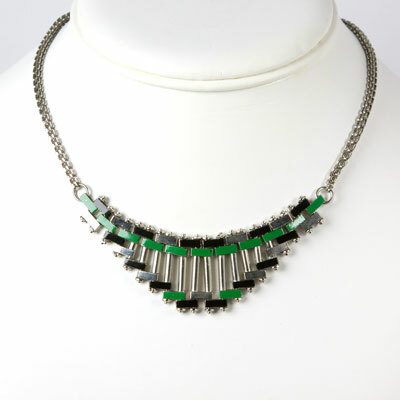 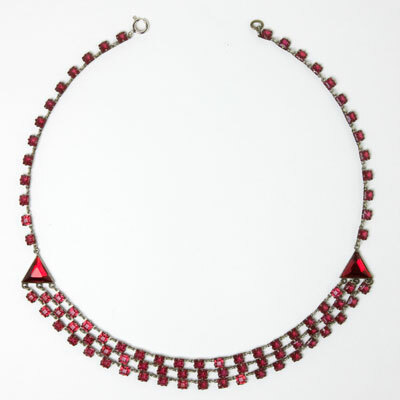 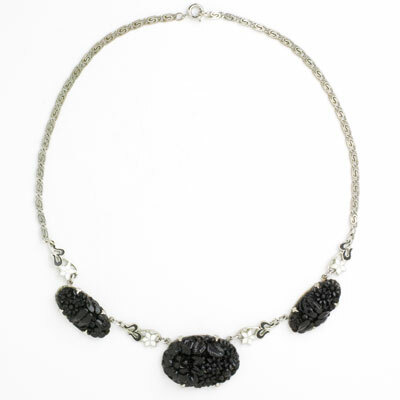 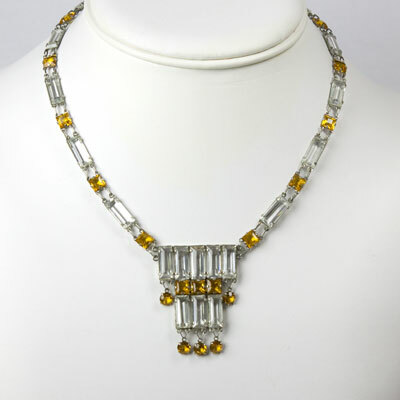 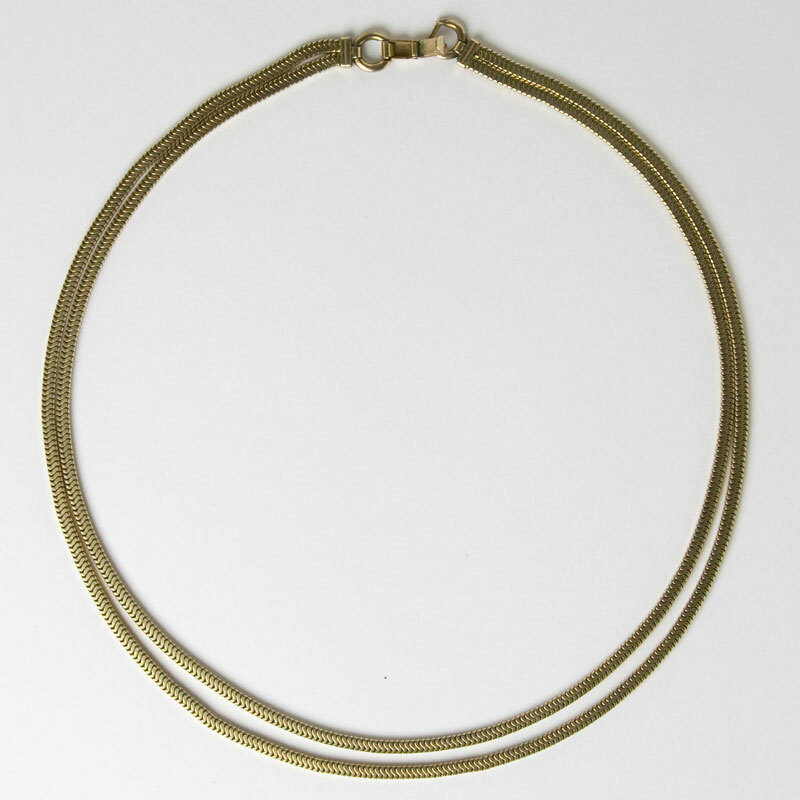 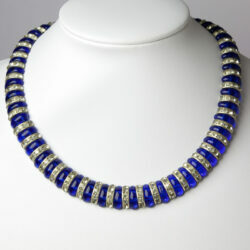 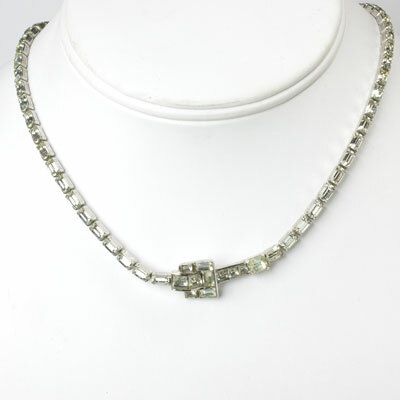 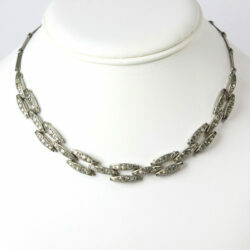 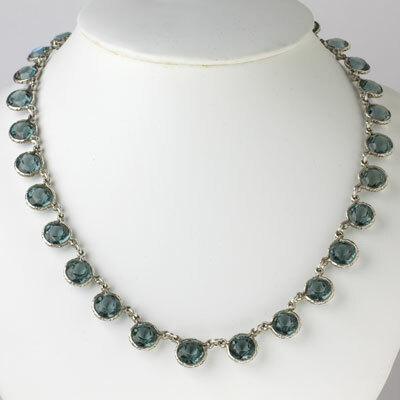 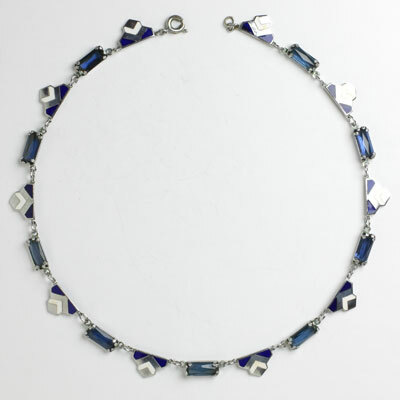 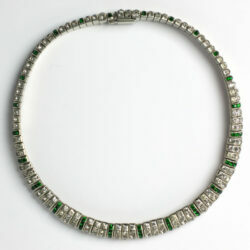 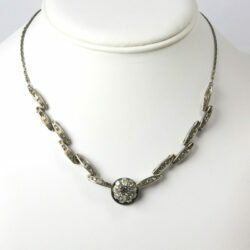 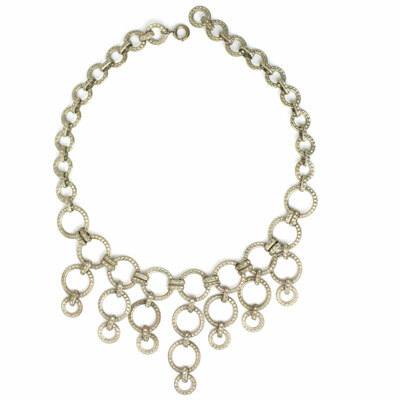 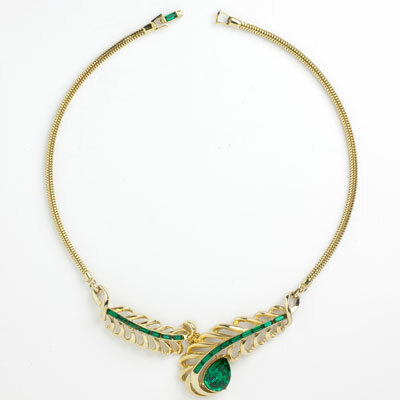 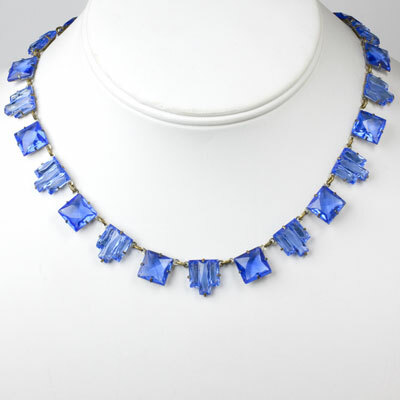 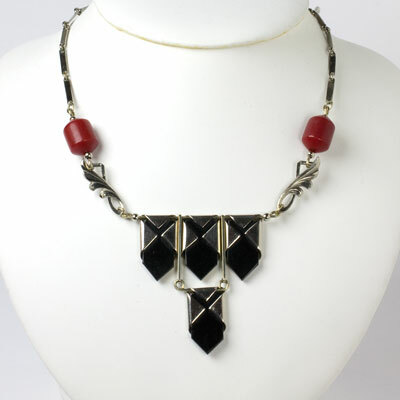 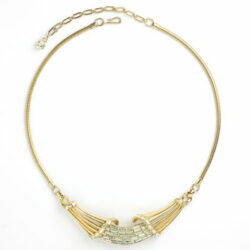 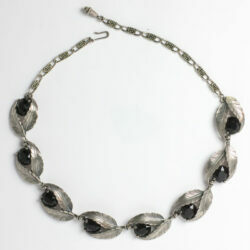 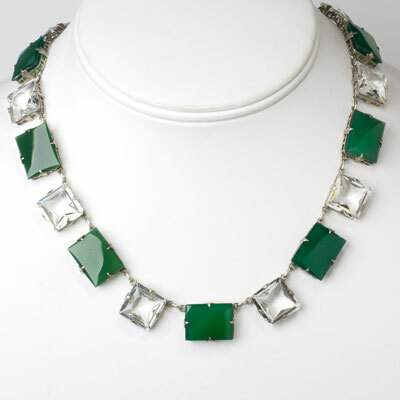 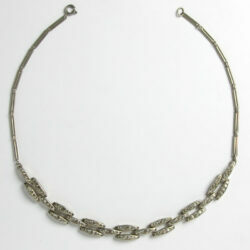 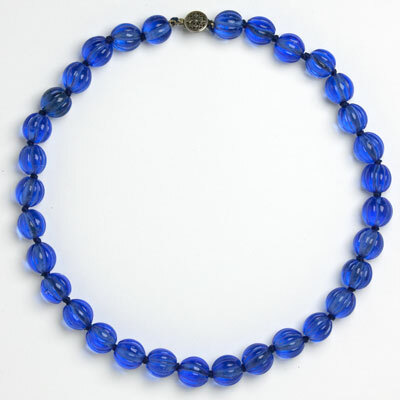 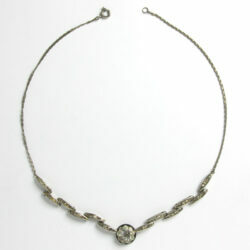 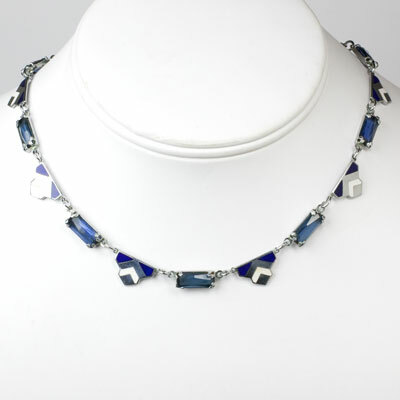 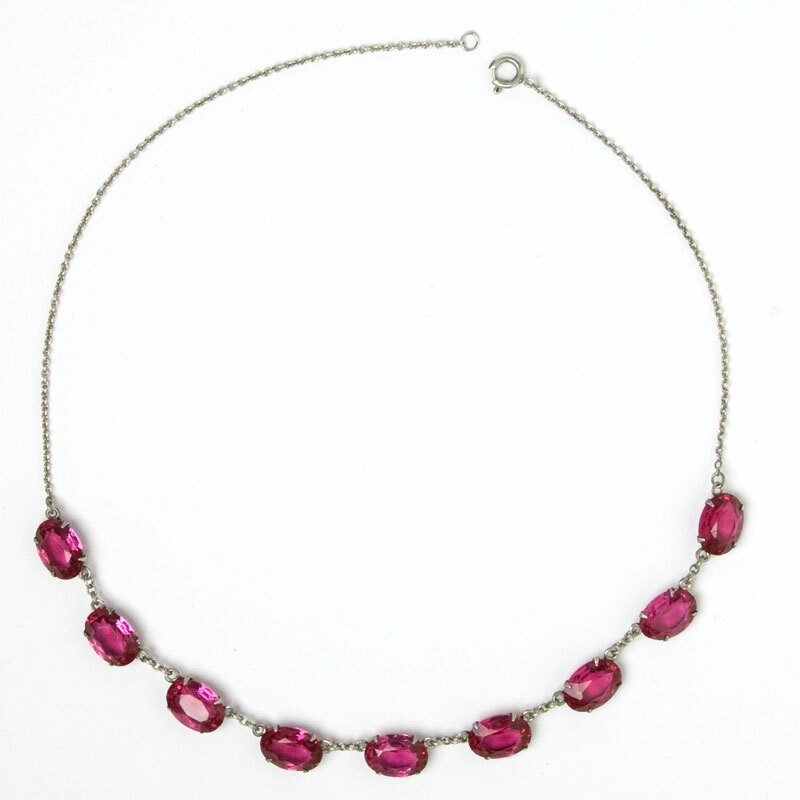 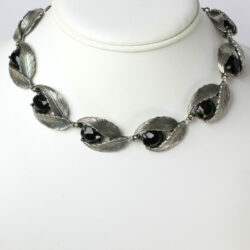 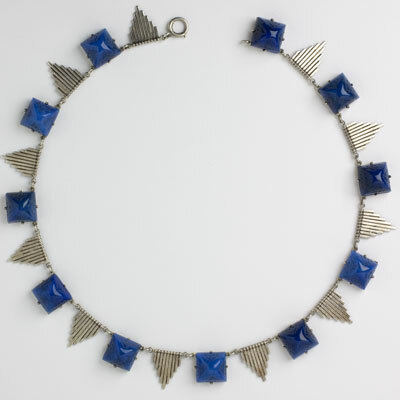 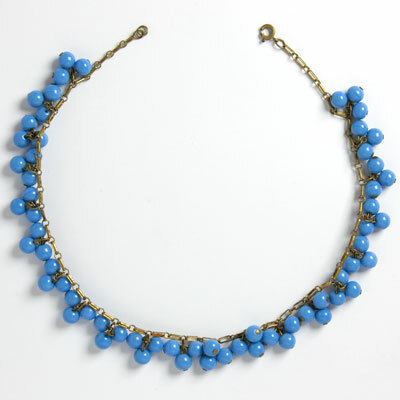 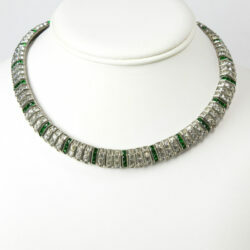 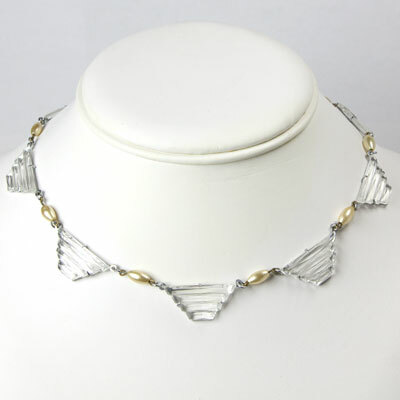 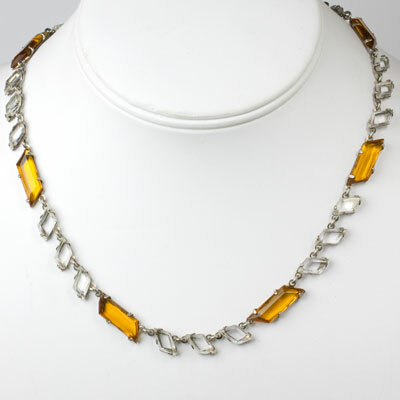 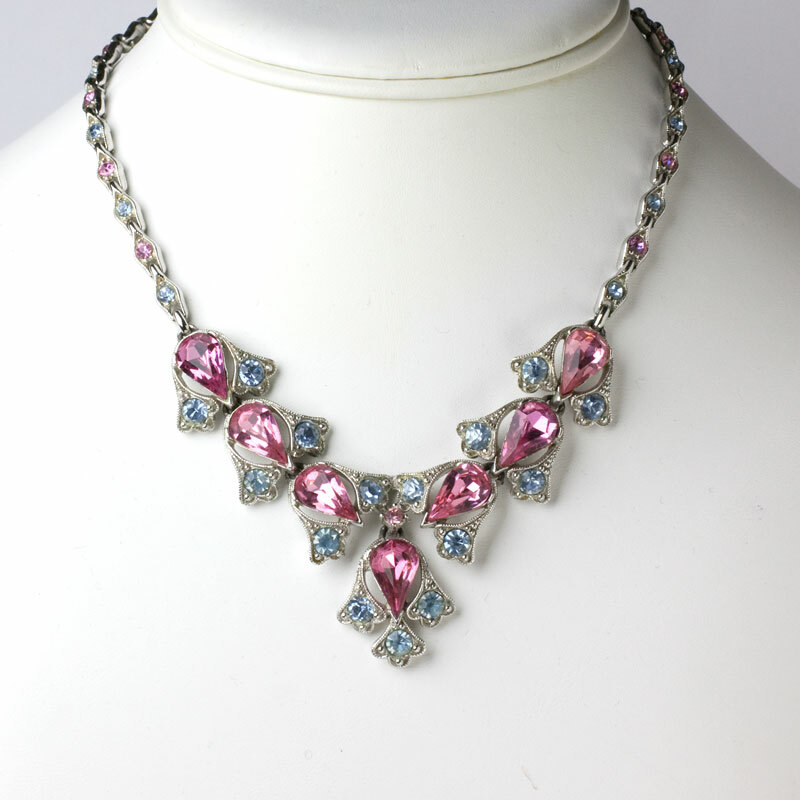 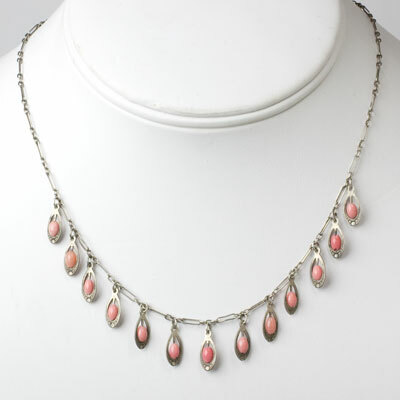 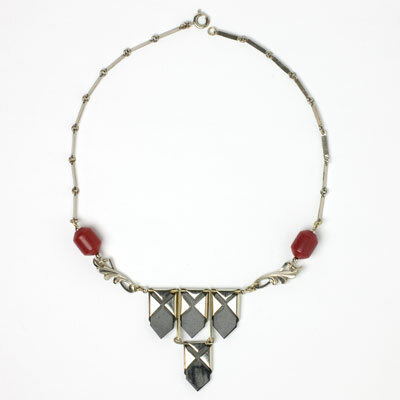 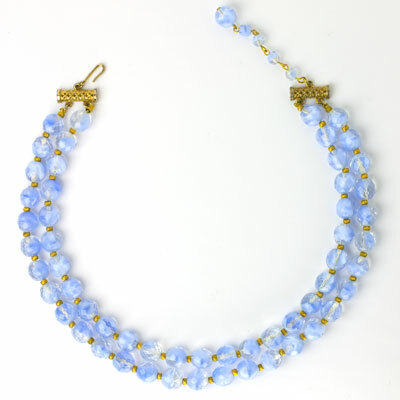 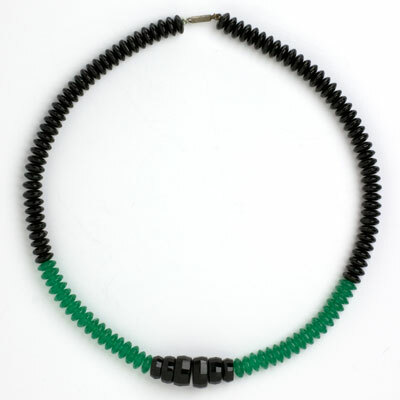 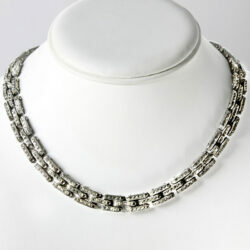 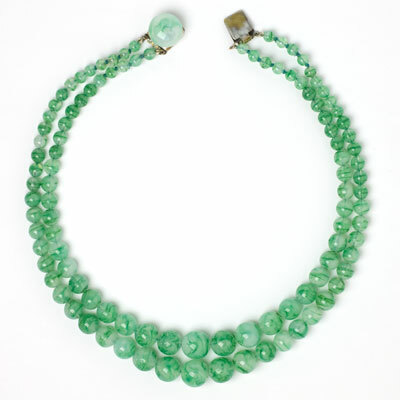 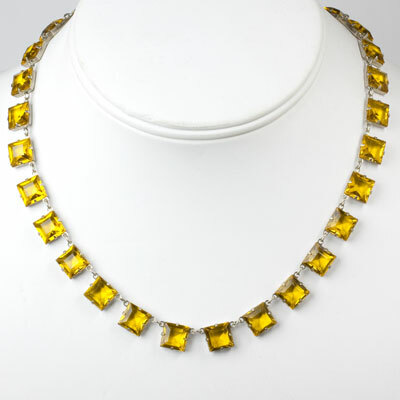 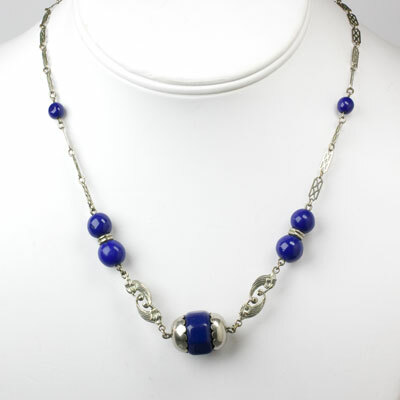 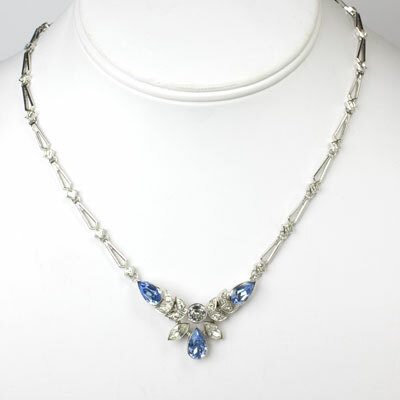 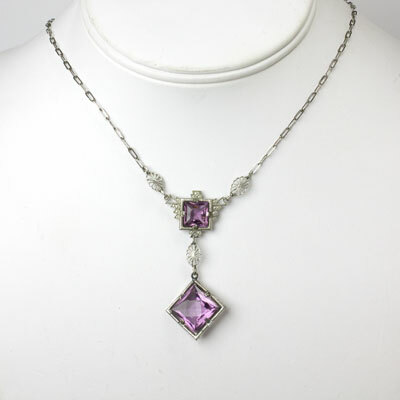 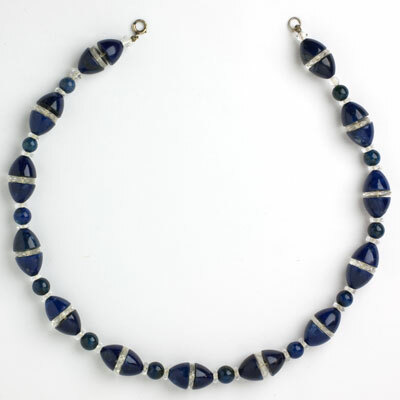 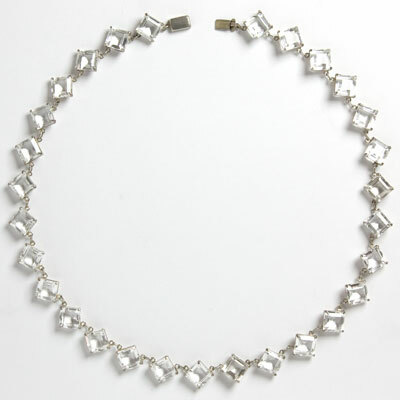 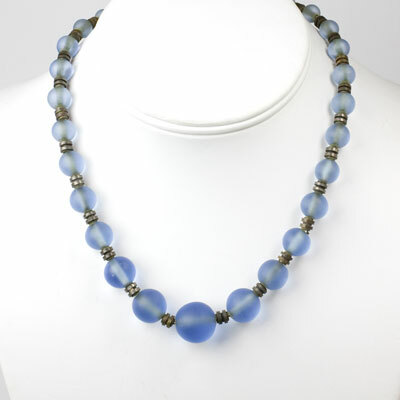 The base of this 1950s Hattie Carnegie necklace is a gold-mesh choker. 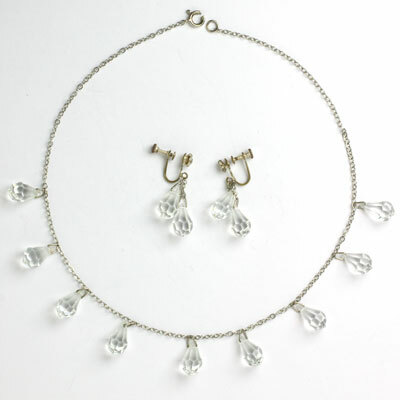 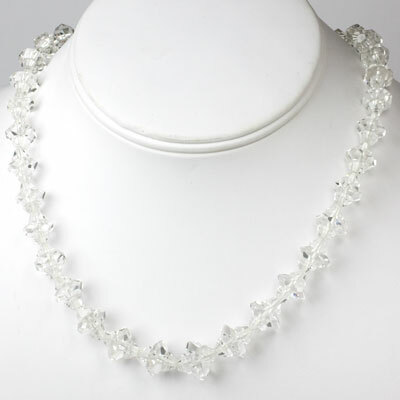 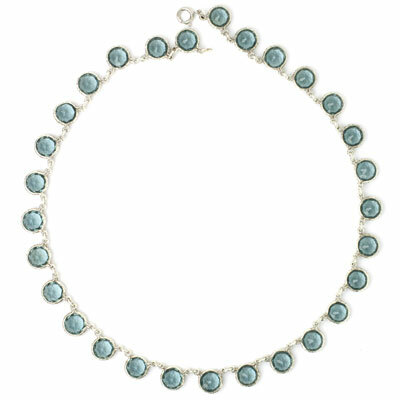 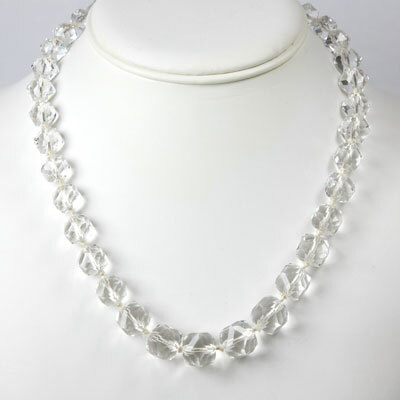 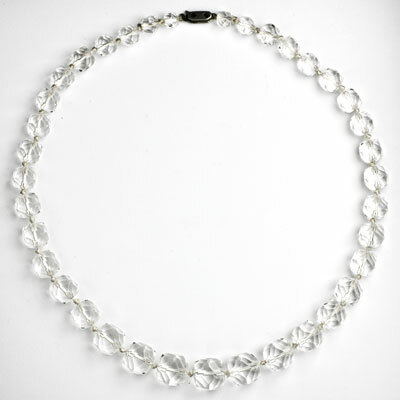 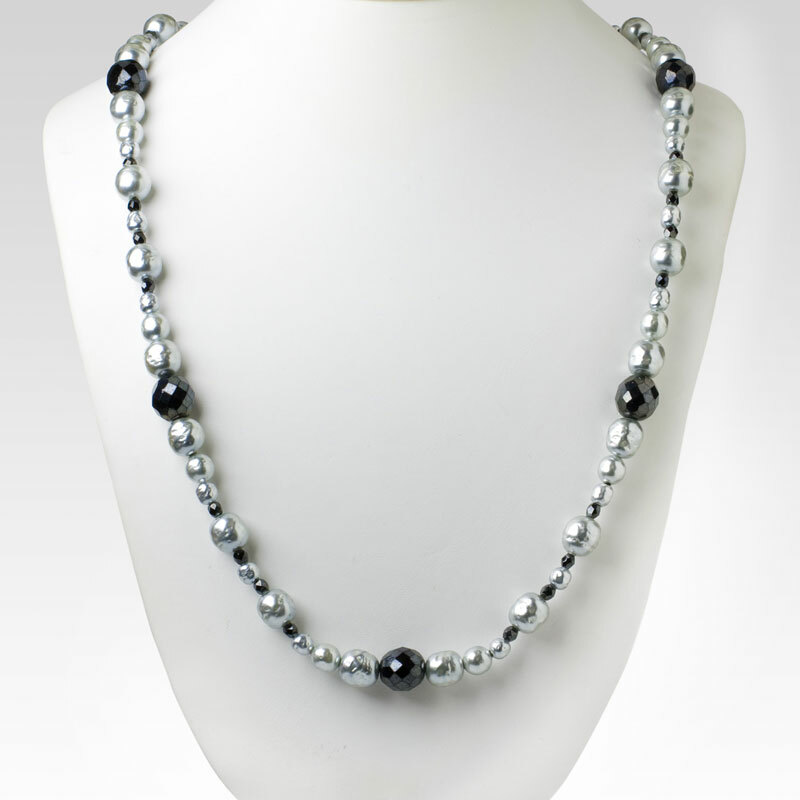 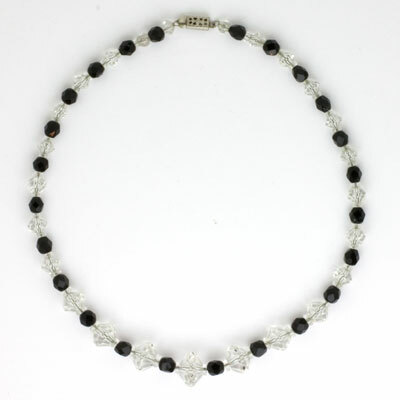 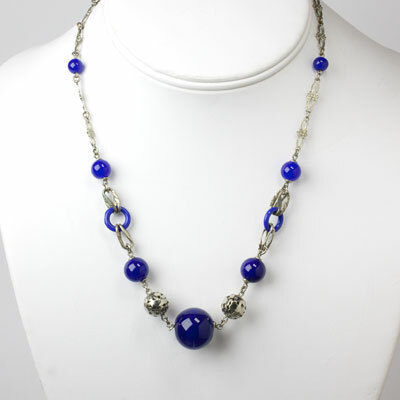 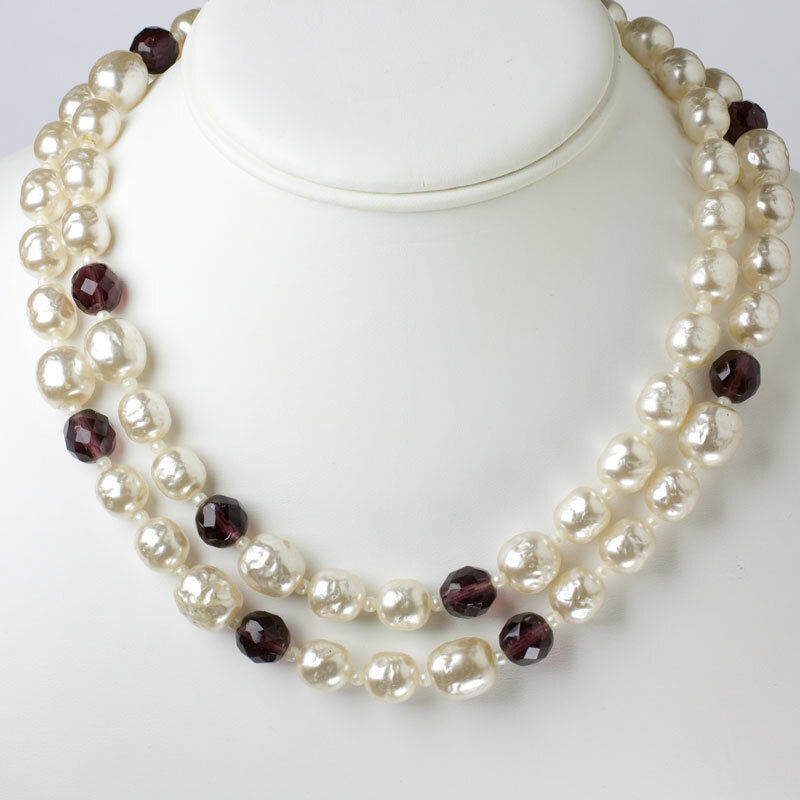 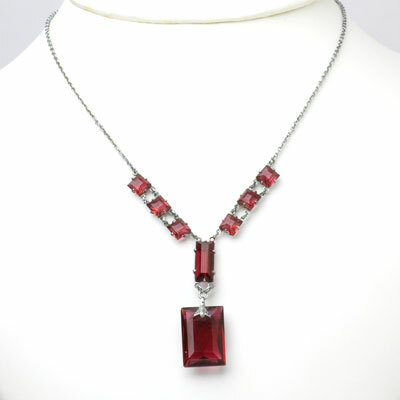 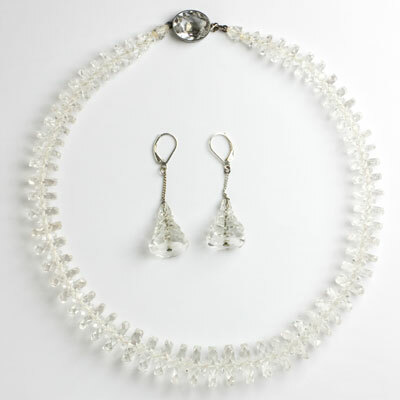 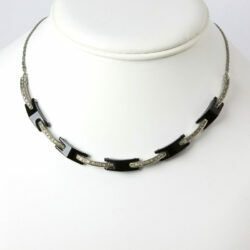 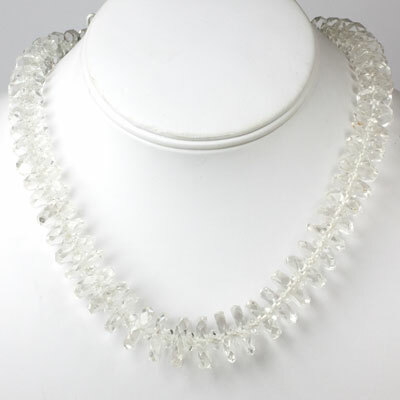 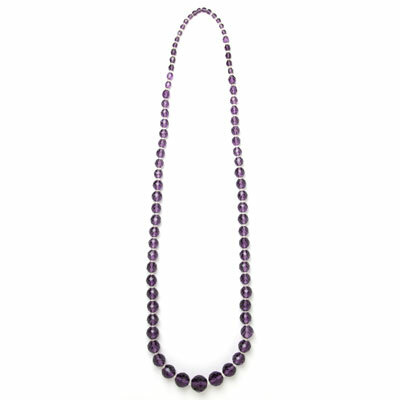 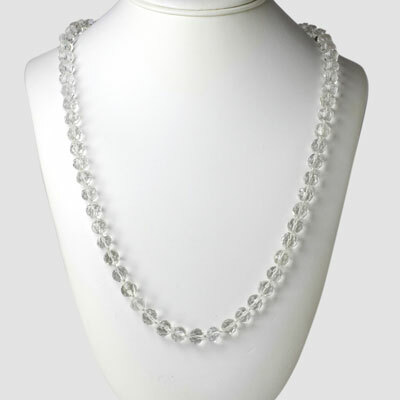 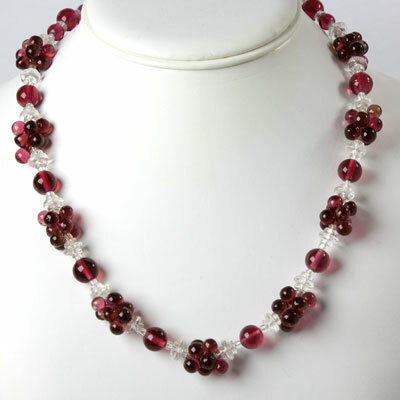 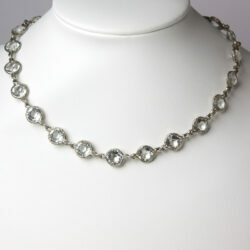 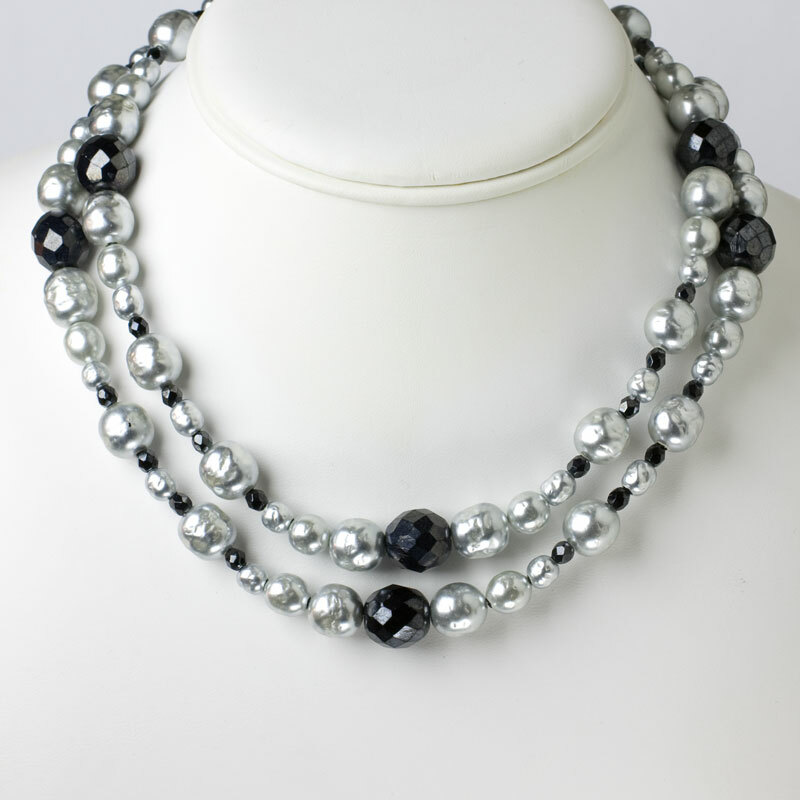 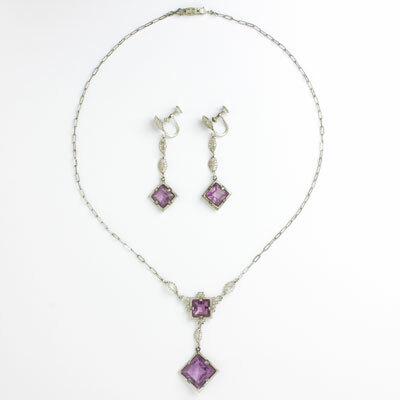 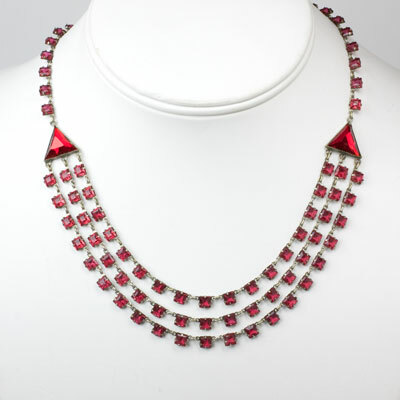 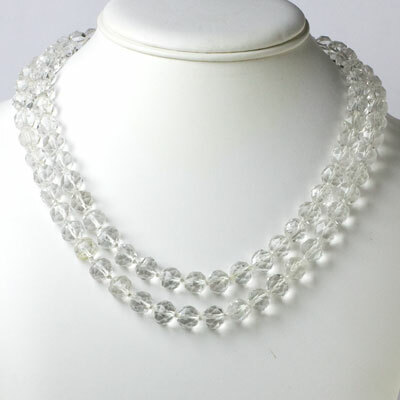 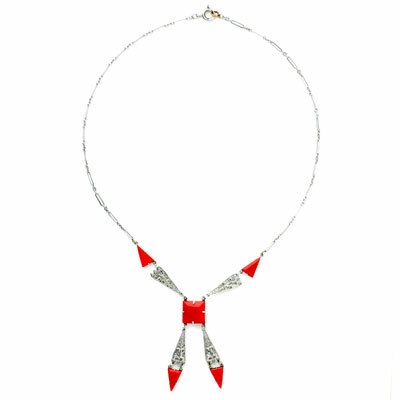 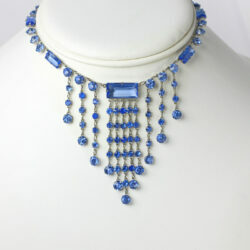 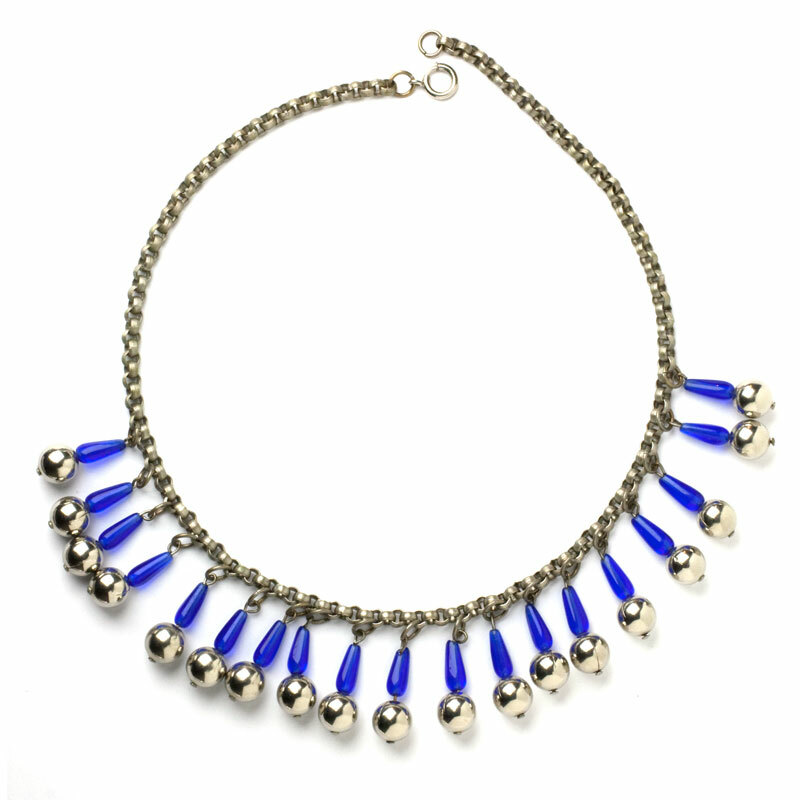 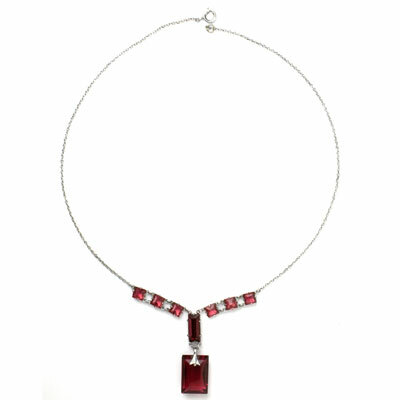 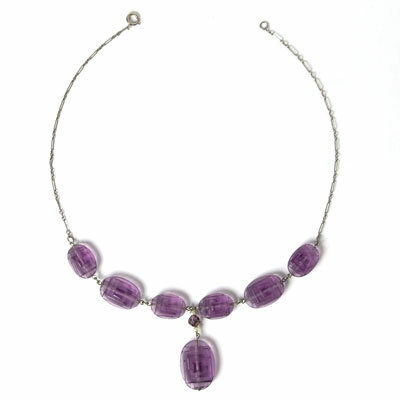 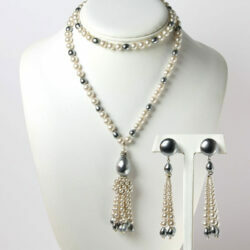 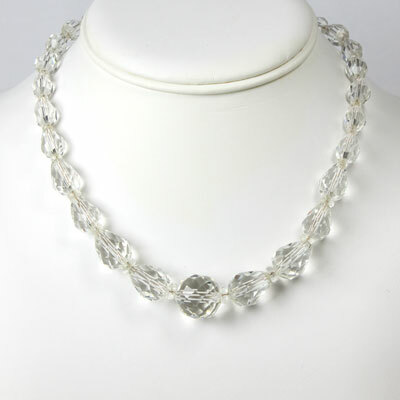 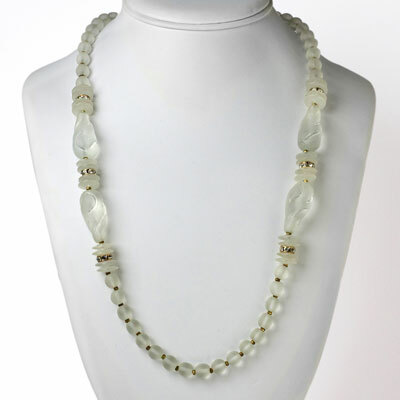 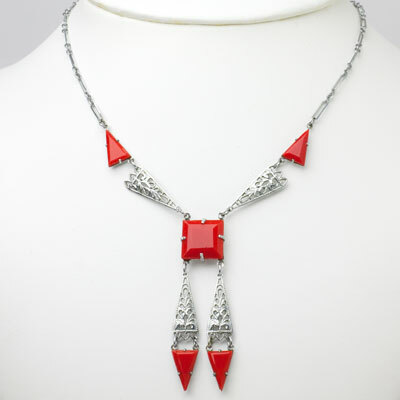 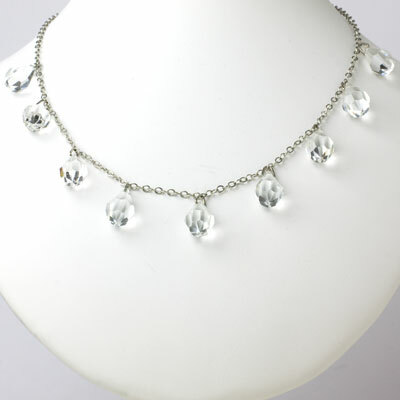 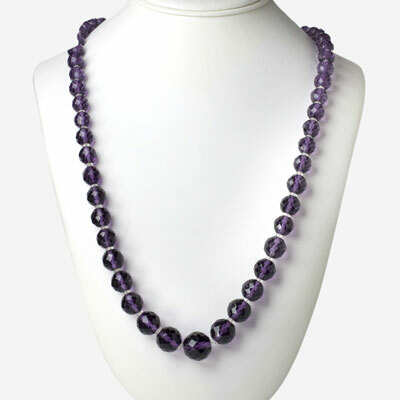 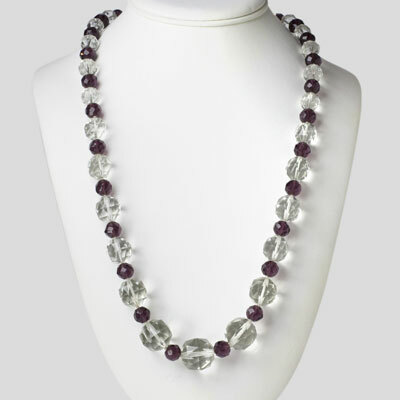 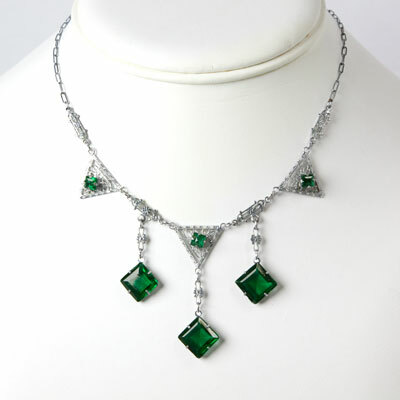 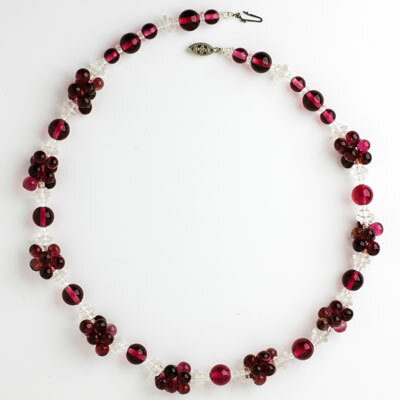 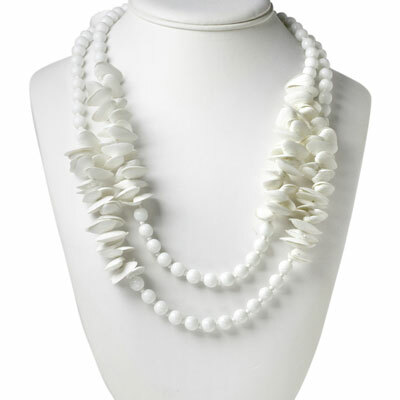 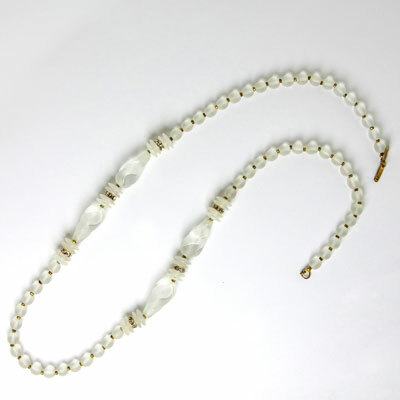 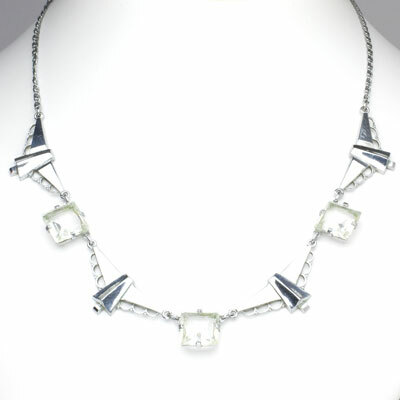 It is embellished with diamanté and dangling glass pearls and faceted crystal beads in various sizes and shapes. 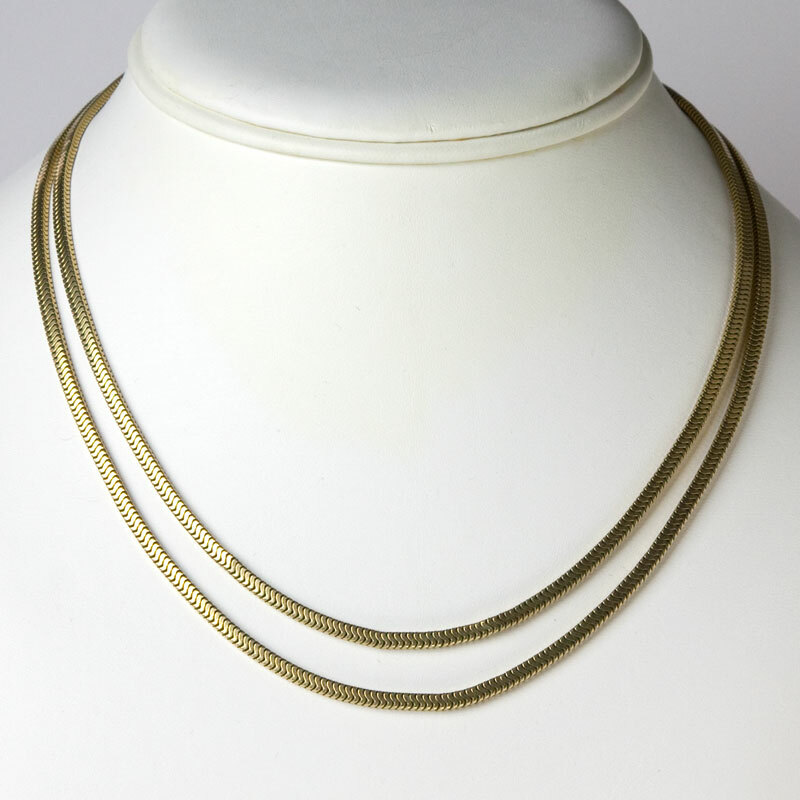 The gold mesh is designed to hug the neck. 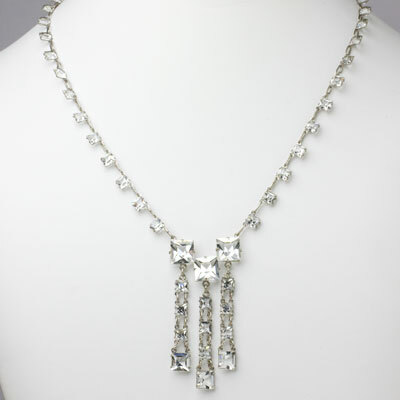 Even the hook on the adjustable hook-and-tail clasp is jeweled. 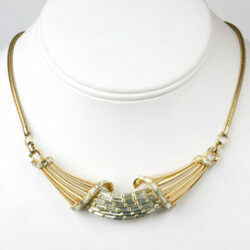 Carnegie designed many pieces with gold mesh. 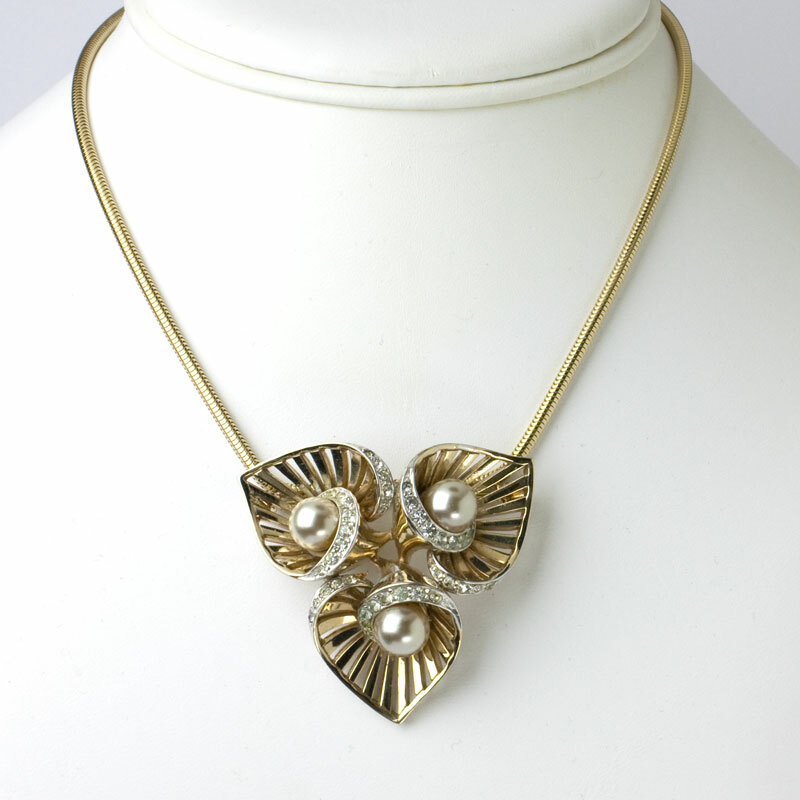 This one has great movement in addition to glamour. 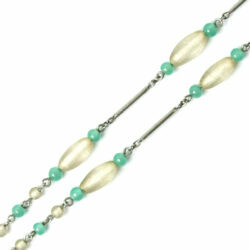 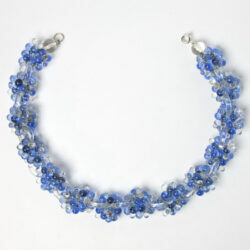 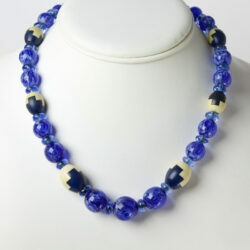 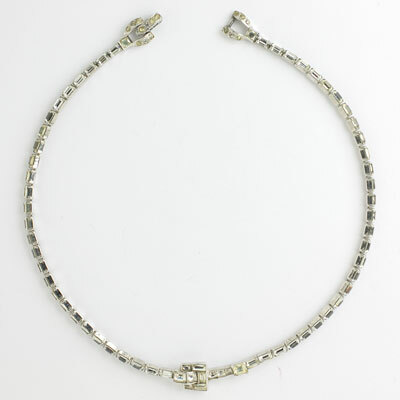 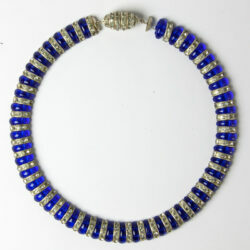 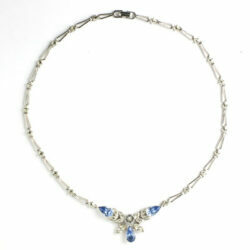 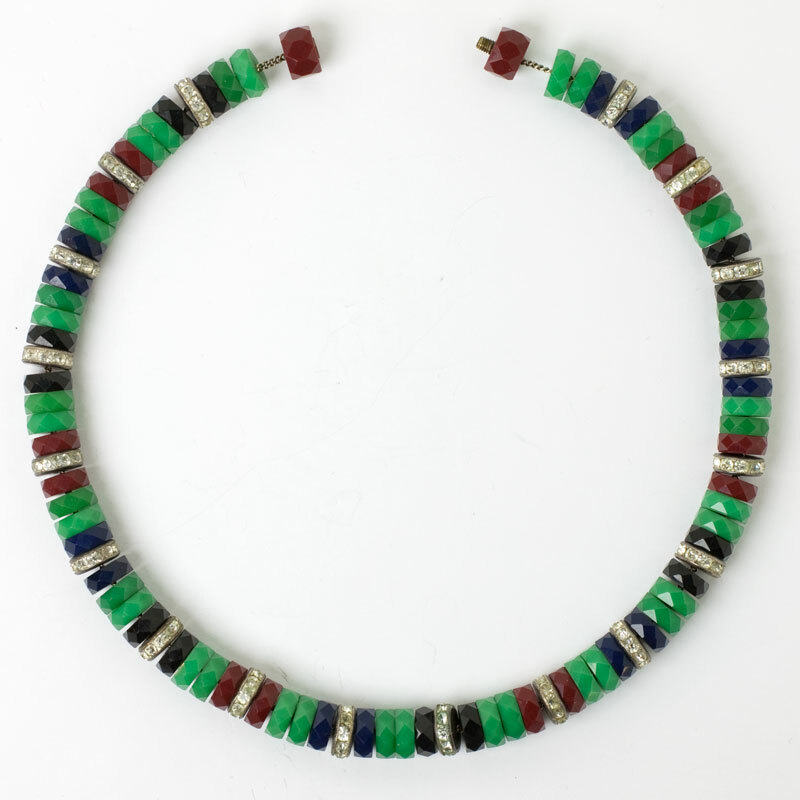 If you like lots of jingle in your jewels, scroll down to see a bracelet by this maker in a similar design.